Looking for a new slow-cooker stew recipe? 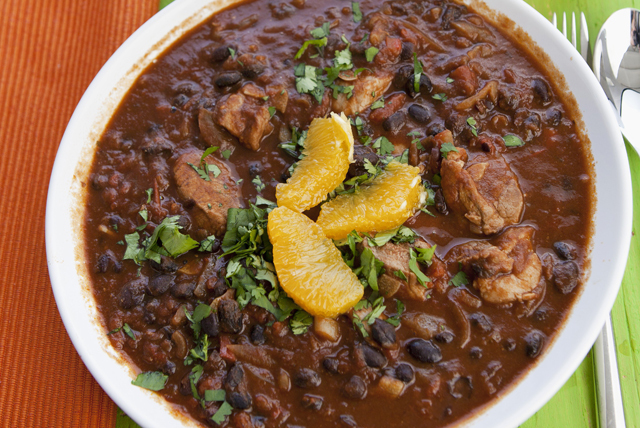 You've got to try our Brazilian-inspired Pork and Black Bean Stew. Pork shoulder is browned in a skillet, then simmered in the slow cooker with smokey chorizo sausage, tomatoes, onions and garlic. Heat 1 Tbsp. oil in large skillet on medium-high heat. Add half the pork shoulder; cook 5 min. or until evenly browned, turning occasionally. Transfer to slow cooker, reserving meat drippings in skillet. Repeat with remaining oil and pork. Add onions to reserved drippings in skillet; cook and stir on medium heat 5 min. or until softened, adding garlic for the last minute. Stir in broth; bring to boil, stirring constantly to scrape browned bits from bottom of skillet. Add tomatoes and dressing; mix well. Return to boil, stirring frequently. Stir into ingredients in slow cooker. Add chorizo, beans and bay leaves; stir. Cover with lid. Cook on LOW 7 to 8 hours, (or on HIGH 3-1/2 to 4 hours). Remove and discard bay leaves. Serve stew topped with oranges. Serve with a tossed green salad and hot steamed rice. This satisfying stew can be prepared ahead of time. Cool, then refrigerate up to 2 days. Or, freeze in airtight container up to 1 month. If frozen, thaw overnight in refrigerator. Reheat before serving. Use sharp knife to cut a 1/2-inch-thick slice off both the top and bottom ends of the orange. Cut the peel and white pith away from the orange, using a downward cutting motion following the shape of the orange. Place the peeled orange on its side, then cut down along the membrane on both sides of each section to remove the fruit.